Missions: Child poverty and advocacy programs against child abuse and neglect. I was born in 1966 in Minas Gerais, Brazil. My father and mother managed to send all four of us children to school, with great sacrifice. When I was 18, I began to read about the missionary life in Africa and realized that God was calling me to serve others in a far land. My passion was to help the needy and proclaim the Gospel to non-Christians. I found an article in a magazine about the Congregation of the Immaculate Heart of Mary (CICM) and wrote to them inquiring about their formation. For months, I was very disappointed to receive no answer. So I decided to talk with a priest in my city about becoming a diocesan priest. I was shocked to discover that this priest, Fr. Rafael Dhont, belonged to the very Congregation I’d written to! Fr. Rafael shared many stories about his CICM mission work in the Philippines and later on in Brazil. The more I heard, the more eager I became for the missionary life. I studied Philosophy in Rio de Janeiro and then began working with poor children in Rio suburbs. During that season, I sensed part of God’s call for me was working with children. After Rio I spent one year in Brazil’s Amazon region, walking through the forest from one community to another with Fr. Louis Rymen. Though it was a challenging experience, I witnessed the zeal the of the missionaries dedicating their lives to the poorest of the poor. I went on to study theology in Mexico City. While there, I worked with street children who called themselves “Las Moscas” because they lived in the trash yet were free like the flies. I learned much with those children and my call to work with youth was affirmed. 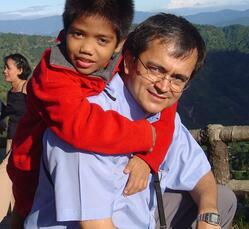 In 1996 I finally reached the Philippines — my mission country. I first worked in Saint Mary’s University and then moved to work in Manila, where I spent two years at an institution that worked with street children. They helped me learn the Tagalog language and I decided to dedicate my life and work to them. In 2000, I began to study psychology, specializing in the psychotherapy for children, with the hope of providing emotional healing to as many of them as I could. Then in 2003, we founded the Saint Louis University Sunflower Children’s Center in order to help abandoned, neglected, and abused children. To this day, I serve the Lord in the Sunflower Center. wounds” which hindered them from flourishing to their full potential. They needed to overcome past traumatic experiences and recover the personal development which had been overwhelmed by the hardships in their lives. Why did we choose the sunflower? Our motto says it best: "Like the sunflower, it is our fervent hope that our children will grow to follow the rays of the sun, and become the best persons that they can be.” Furthermore, this beautiful flower is a symbol of our region here in the Philippines. 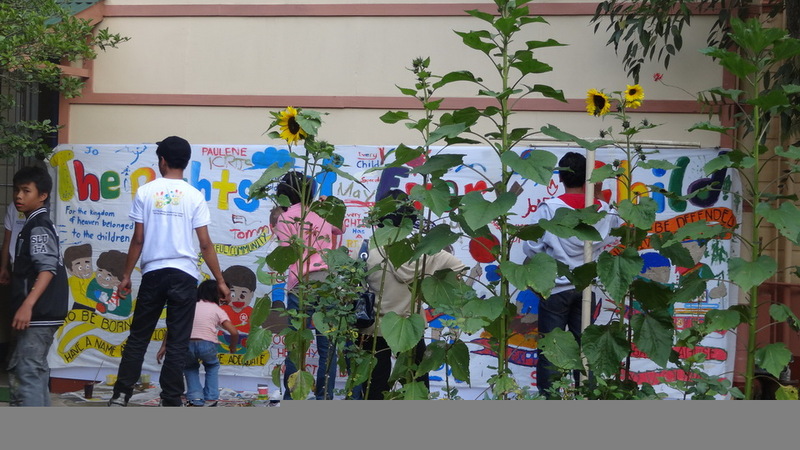 Sunflower Children’s Center offers psychotherapeutic intervention and psychological assessment as its primary services. The entire therapeutic process is clinical and diagnostic in nature, and findings and recommendations are contained in a psychological report. Furthermore, we help parents and guardians cope with the difficulties they face in managing their children’s behaviors. For children referred by institutions, the Center works closely with the client’s social worker and other caregivers (i.e., houseparents). Besides applying my love for psychology at the Sunflower Center, I also teach psychology in the graduate program of Saint Louis University. Please pray for the children, the most needy ones who have been abused and neglected. Pray that we may be the God’s healing hand for those children. Pray that family ties will remain strong enough to protect all the children at risk.